A post office dramatic play center is always a hit with the kids! 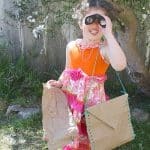 You can easily set up a pretend post office at home or in the classroom with just a few basic supplies. 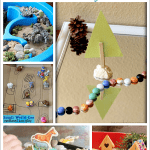 What a great way to encourage imaginative play, as well as writing! 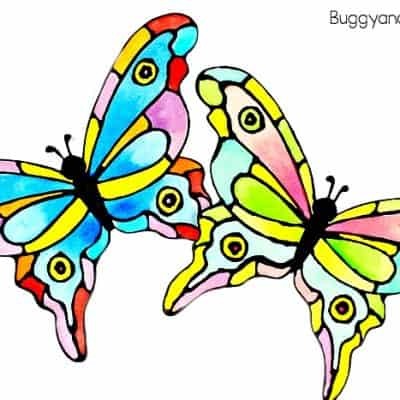 Follow Buggy and Buddy on Pinterest for even more ideas! Do your children love everything about the post office and mail like mine do? My 2 year old, Theo, goes absolutely crazy every time he sees a mail truck. My 5 year old daughter, Lucy, is almost obsessed with checking our mailbox every afternoon. Both kids are constantly writing my husband and me little love notes and pictures. 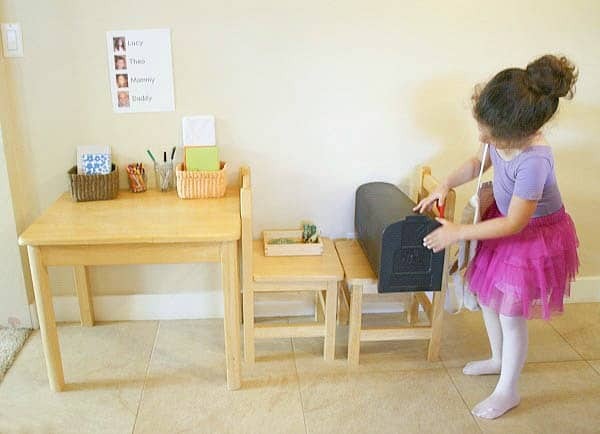 You can use just about anything for your pretend play post office. 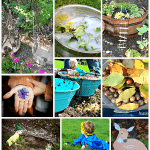 I looked around my house and grabbed things I thought the kids would enjoy using. Writing Materials: I put out some notecards and paper along with some envelopes on the table. 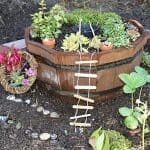 Both are in little baskets to keep them in place. 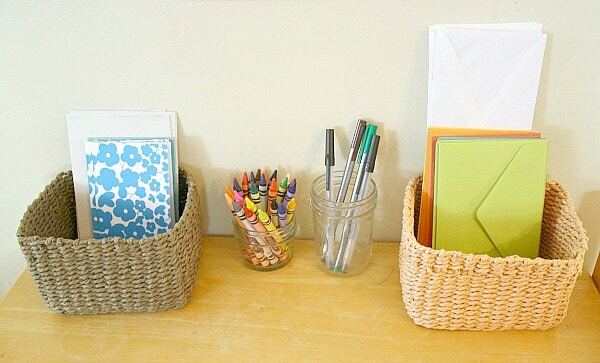 I also placed some little cups of crayons and pens where they would be easily accessible for writing. 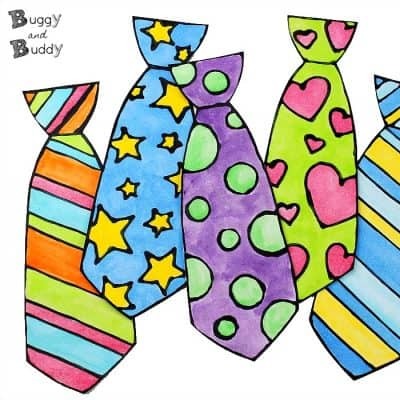 Once the kids have written their letters and placed them in an envelope, it’s time to get the envelope ready to mail! Name Resource: I made a little poster right above the table for the kids to use as a resource for addressing the letters and envelopes. It’s just a sheet of paper with a picture of each family member with the corresponding name right next to the photo. Mailbox : This was the one item I decided to buy- a real mailbox . 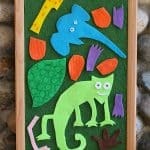 (You could make your own by decorating a shoebox or packing box.) 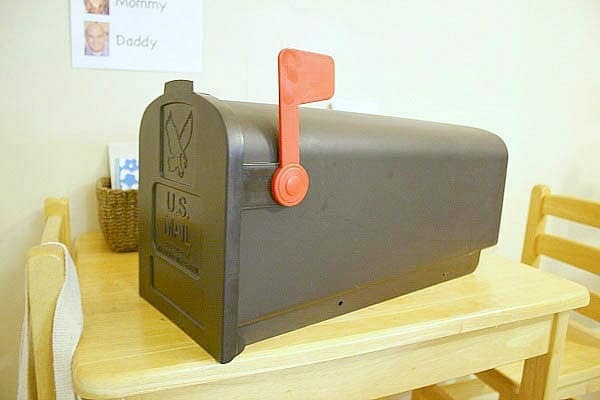 The kids place their stamped letters in the mailbox for the mailman to pick up. 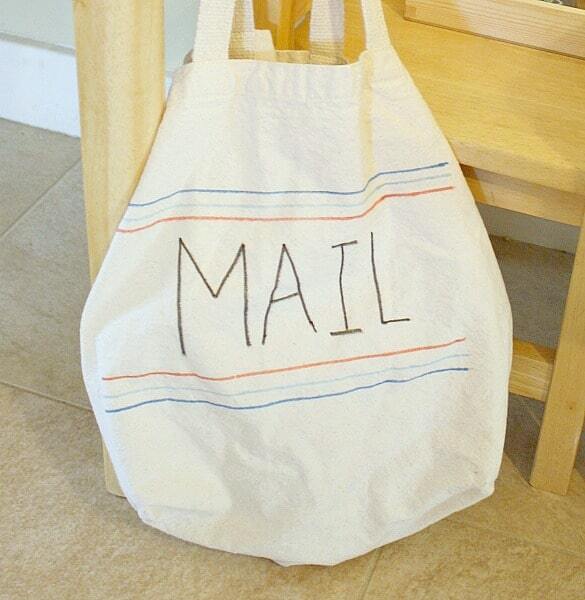 Mailbag: For the mailbag I used a plain canvas tote bag and decorated it with fabric markers . The mailman collects the mail from the mailbox and places it in the bag to be delivered. Right now the mailman delivers the mail under each person’s bedroom door, but I’m thinking it’d be fun in the future to make our own personal mailboxes! This is such a fun way to encourage writing (we’re always looking for fun writing activities for kids). Lucy is so motivated to write her thoughts and ideas onto paper, and Theo loves pretending to write just like his big sister! Theo really loved putting things into the mailbox. 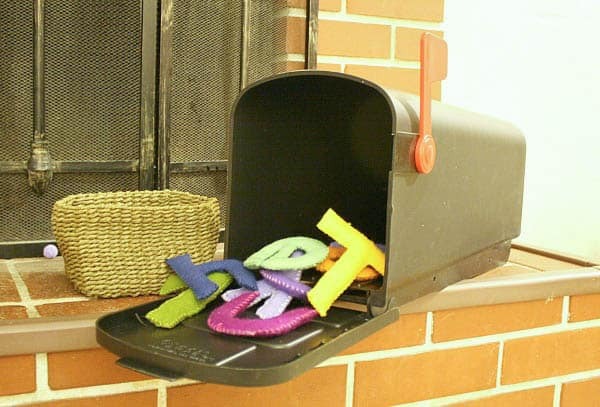 When he heard us talking about putting letters in the mailbox, he ran and got his ‘letters’ (his felt stuffed toy letters) and started putting them in. Too cute! I just love that both my kids enjoy using the pretend play post office- sometimes on their own and sometimes in imaginative play together. 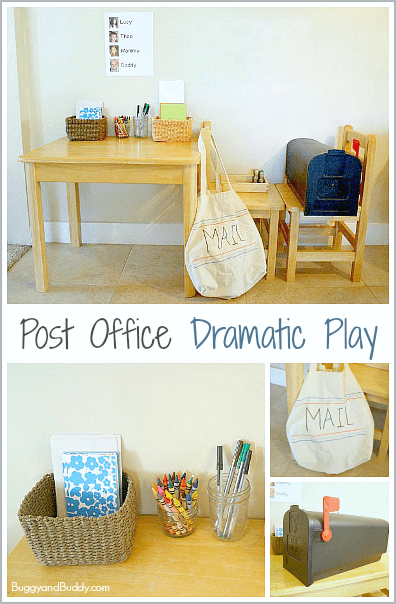 The dramatic play post office center is appropriate for just about any age. 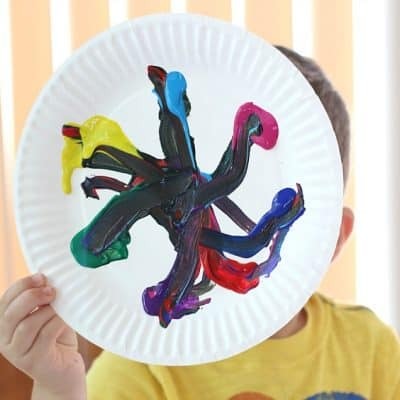 Toddlers enjoy making marks on paper, putting things into and taking things out of the mailbox. 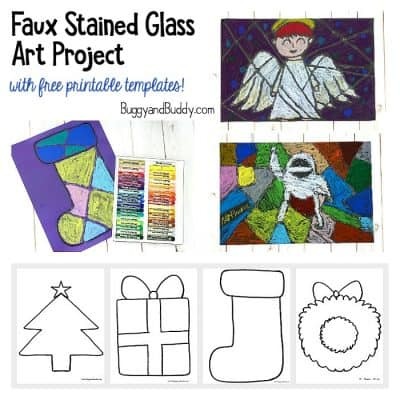 It’s such a fun way to encourage preschoolers and kindergarteners to write and create. 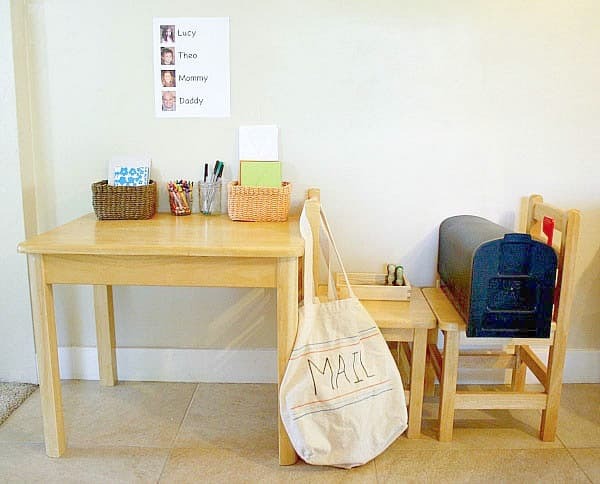 Older kids can use this center to practice how to correctly write friendly letters and address envelopes. 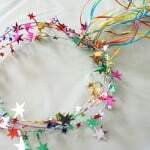 This would also make such a fun learning center for the classroom- especially around Valentine’s Day! Oh – I must say … your post office looks so much nicer then mine!!!! I love the touch of the REAL mailbox! 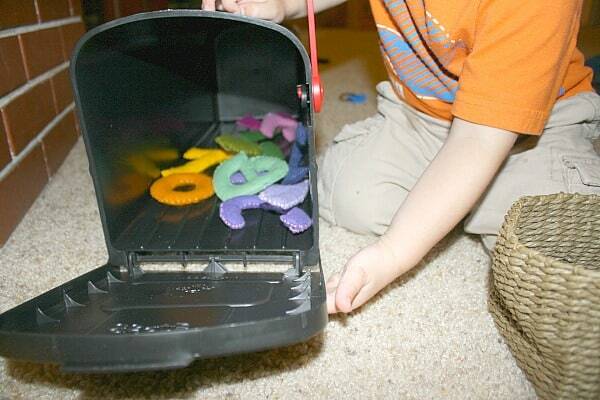 I love this mailman play idea! 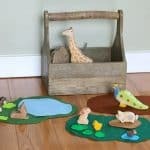 I pinned it and left one of our pretend play centers! This is a really cute post office! I work in a preschool and we have these rooms set up which we term it as “Dramatic Expression”. It is Laundromat at the moment! 😀 I will share this post with my colleagues! Thanks for sharing. Book marking your site too! I love your post office. 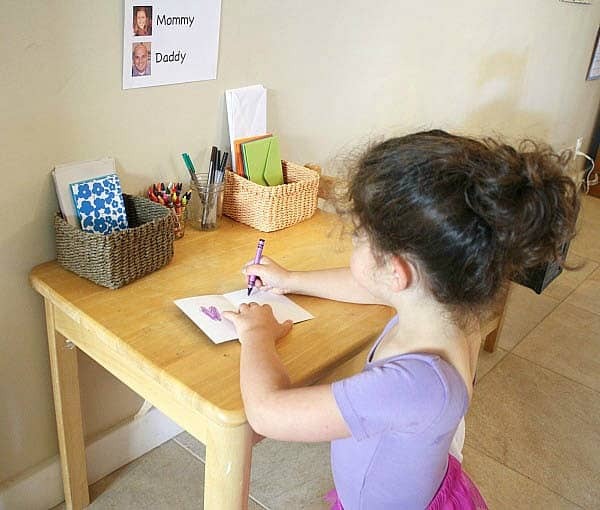 We are a little out of this age, but we do have a letter writing setup for our second grader with real stamps, address stickers for grandparents, paper and cards. Playing post office is a great hands-on play experience. You get to practice a lot of skills that you do not even realize that you are reinforcing lessons you have learned. Thank you for sharing and for linking up this week to the Thoughtful Spot Weekly Blog Hop. 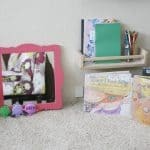 Thanks for your recent post office posts – a reminder that I need to clear some space to do something like this in our house. 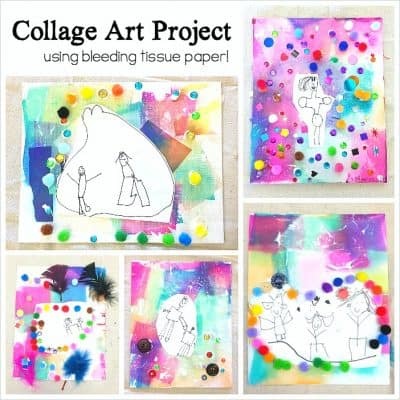 My preschoolers love to write notes and I know my daughter would love this. Thanks for sharing at After School!